As I approached the end of my final year at one of the great universities (at least according to Captain Blackadder), I actually considered joining the forces, as an officer. I actually used to do some physical exercise back then and having met Mrs Ches several years earlier, I was already well accustomed to being told what to do. The one thing that held me back was the film Platoon, specifically Lieutenant Wolfe’s failure to gain any kind of respect from his three Sergeants. Critically he lacked knowledge and experience, which, when ambushing NVA close to the Cambodian border counts for a fair bit. In fairness it was actually Wolfe’s lack of character and incompetence that gave root to Barnes and Elias’ failure to recognise his leadership, but what I took away from the movie was that to lead well you had to have put the time in with the grunts before you could effectively lead. Having played my first game for the Quokkas back in 2009, I think its fair to say that I have spent more than enough time with the grunts deep in the outfield, so when given the opportunity to repeatedly instruct Faggie to move three feet to the left or right and stand with hands in pockets at second slip all day, like all good cricket captains do, I embraced the opportunity. Yes I’m talking about the Quokkas captaincy here (Skip second honeymooning in Venice – probably the only place with more water than Coldharbour) and after a very long and very hot summer chasing dispatched long hops, my time had finally come. Said summer had started for me watching Pete Tong and Jules Buckley conducting the Heritage Orchestra perform Ibiza classics. It peeked when consuming a fourth bottle of bubbly on the Solent celebrating my mums 70th and when Evil caught the International Cricketer of the Year off my bowling. More recently the summer months have revealed the band IS Bliss (three Southsea shoegazers that amalgamate Adorable with The Verve – Storm in Heaven, pretty much everything I could ever want from a band) as well introducing me to Tesco’s Finest chorizo burgers. But with Virgin Media’s annual price hike letter received through the post and my car’s dual mass fly wheel seemingly on the wane after trawling around the M25 all season, Coldharbour CC, the final fixture on the Quokkas 2017 calendar, would seem to point to where it would end. As with Pete Tong’s musical collective, with the long summer sun on our back, the Quokkas have performed to a standard perhaps never seen before. Runs, wickets, even the odd catch have contributed towards a decent, if all be it condensed season of cricket. But now as the last game of the season approached, and with the weather emulating a Vietnamese monsoon, the question quickly became: can the Quokkas do it on a cold Tuesday evening in Stoke? Or should I say, a cold and very rainy Sunday afternoon in Coldharbour? 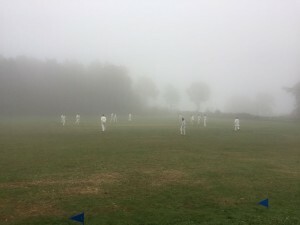 When your Quokka blazer fits you snuggly due to the four jumpers, the opposing skipper comes out to bat in a gillet and post rain storm mist is so thick that the batsman can’t see the bowler at the point of delivery, you know the summer is all over. But the game still managed to provide a few more highlights to my summer. On discovering that I was to be the captain I immediately turned to my copy of Mike Brearley’s book “The art of captaincy”, to gain insight into the role. His talk of sacrifices and social cost were hardly inspirational and to be honest I’m more of a Jackie Moon type leader (Semi-Pro – check it out). As Jackie said, `I’m not really an X’s and O’s guy. I’m not a tactician. I’m more of a motivator in the classic sense of the word. You know, Lombardi, Charles Lindbergh, that nun over in India’. Which is just as well as I was quick to discover that the real challenge of cricket captaincy is getting a side out. Very much like Quokka calling, players are in, out, yes, no, maybe. It’s very much like herding cats only Quokkas are more slippery. Despite this, using my motivational skills and desperate pleas, I managed to rope in The Professor and gratefully accepted the offer of a spare Coldharbour player. Come wind, rain or more rain, the game was on. When you have just eight Quokkas available, the last Whatsapp message you want to read half hour before play is that Evil Dave and The Egg are still in St. Albans. It could be worse though, two further players could go completely missing, only to eventually reappear on the outskirts of Reading just as play is due to start. 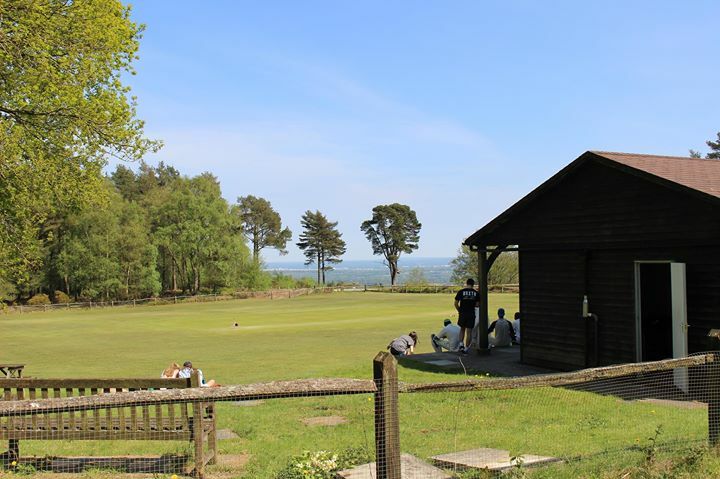 Acton, West London to Coldharbour Cricket Club, Surrey is about an hour and 20 minutes’ drive on a good day. It takes somewhat longer if you go via Cold Harbour, Reading, Berkshire though, as Kashif and his trusty `navigator’ Faggie discovered. I thought asking to borrow three Coldharbour players was taking the Michael, but I was now faced with the prospect of asking for seven. 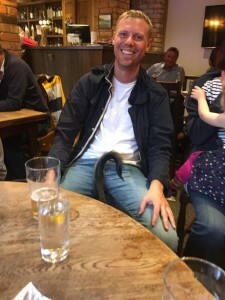 Fortunately, Coldharbour CC has a skipper named Beer, with a relaxed attitude to match, and with a deluge expected around 3pm, we agree a 20 over affair (anyone else instantly minded of the Kiwi and lemon flavoured fortified wine when 20:20 is mentioned) and he was happy for us to bat first. Having agreed on 20 overs, my immediate thought was that the shorter form of cricket brings with it risky batting and quick wickets. Not something you want when your scorer is padded up and the umpire is next in. I was also worried the innings would be half over by the time The Egg and Evil arrived, and the match completed by the time Kashif re-programmed his sat nav. Despite the earlier offer of a Coldharbour player to join our ranks, I found that they were all slightly reluctant to desert their team, but I tempted Dan by offering one of the opening batsman sots. He later informed me he was a bowler, but he certainly looked competent with the willow, providing us with the solidity we needed whilst garnering 42 runs carrying his bat over the full 20 overs. At the other end The D.O.C. started pretty slowly, offering the opener a maiden. I had informed the others of the reduced game length, right? But he was quite right to be cautious as the opening bowlers found a terrific line and were also gaining considerable movement through the air. Lesser players would have struggled to survive and once the opportunity arose the D.O.C. produced some of his effortless cover drives. 40 runs from the first seven overs was certainly a very good return and things were going, so well in fact that I almost forgot our lack of numbers, that is until a beauty of a ball clipped the D.O.C.’s off peg. Scorer, umpire and batsman musical chairs thus commenced. Tom the Yak was next in and he got off to a brilliant start, striking four fours from his first six balls and making light work of the slow track and very good use of the short straight boundary. The next six overs went for 43 runs, with both players demonstrating excellent timing and choice of shot. By the time Tom was bowled for 28, our ranks had swelled, allowing The Egg to grasp the scorers pencil and Evil Dave to stride to the middle. Keen to ensure the pace didn’t drop he immediately struck three more fours from his first five deliveries. The brutal attack continued with several trade mark smashes and a bludgeoned six that pretty much split the Slazenger Victorious ball in two. When bowled for 26, almost forty more runs had been added in just four and a half overs. Dan informed me as I made my way to the middle that a score of 150 to 160 was respectable. To be honest, I was just happy that we’d made it this far without losing the five wickets we had, but nevertheless we continued to attack. 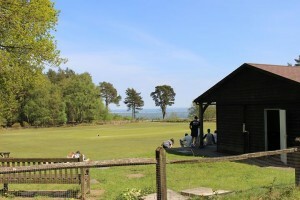 Following Dan’s lead, I pulled two short balls to the boundary and then sent a beamer over the club house roof. 15 from the over, followed by nine more in the next and then 19 from the last (including a big six to end the innings from Dan) took us to a very healthy 169 for 3. Keen to complete the game before the heavens truly opened, there were murmurings of an immediate turnaround, but a vast array of superb sandwiches, a proper cream tea and numerous iced cakes provided us with the perfect reason to delay proceedings. As the third scone went down the hatch, Kashif and Faggie duly arrived, which would save us from having to search for lost balls deriving from my lollypops. With the rain continuing to fall, we discussed the attraction of the Hamburg Reeperbahn, Wren Kitchen’s appalling radio advertisement and Gavin McAlinden’s next stage production. Fascinating stuff, but with the weather closing in we had a winning season to, er, win. Despite my desire to take all pace off the ball, a frustrated Faggie (not quite a car broiled Evil, but certainly a man ready to unleash hell) presented the ideal opening bowler up the hill. I immediately regretted not having a first slip in place to catch an edge off his second ball. As all woeful captains do, I reposition my field to where the ball just went, but my failings matter little as the opener is cleaned bowled by Faggie two balls later. At the other end, The Professor brilliantly clean bowls the number 2 bat, but he reminds us that we made the exact same start last year, only to find the real batting talent was down the order. Maybe this time it would be different and when my excellently placed first slip caught a gloved Faggie bouncer, it certainly looked that way. As the rain hammered down I was minded of a comment from Mrs Ches: “Do you cricketers not play in the rain because you are worried your little white outfits will become see through?”. She knows which buttons to push, but The Professor did start to look like one of Take-That in the Back for Good video [Ed: All respect for your musical taste instantly gone]. I digress. We were very much on top, so the perfect time to bring both Kashif and The Egg into the attack. Egg proved pretty much unplayable, taking two wickets [Ed: it could easily have been four], including having their skipper stumped from a beauty. Kashif, was equally unplayable and he also took the key wicket, sending it cartwheeling towards the D.O.C. in fact. The only thing that could prevent us winning now was the weather. Not the rain I might add, we had now played through that, it was the thick mist [Ed: also known as Fog, but I concede that ruins the Gorillas/Quokkas in the Mist headline] that had enveloped us as the rained stopped and the temperature fell. Perhaps bringing Evil Dave on when visibility was down to five metres was not the smartest move on my part, but he had the good sense to take the pace off the ball. It was actually the fielders that were in the most danger and not from the ball either. The damp conditions made it increasingly hard for the batsman to keep hold of their bats as they tried in vain to smash Dave out of the ground. Time for another change of bowler. If you want someone to take the pace off the ball, there is no one better than Tom the Yak. I’d held him back long enough, but in a brief spell he completely cleaned up the Coldharbour tail and in doing so, saw us home to a marvellous 50 run victory. This captaincy lark is a doddle! OK, so I concede that my leadership skills may have had little bearing on the final result, but as the rain returned and we celebrated in The Plough over pints of Crooked Furrow I still concluded that it was a great experience and certainly another highlight of my summer. It’s certainly not easy though and my respect for Lockie and Skip in the way they bring a team together has increased immensely. That said, should I ever be asked to cover for Skip on yet another honeymoon I might choose to ignore Mike Brearley’s advice of `find someone else to captain’. Proper swing bowling that was. Pitch it up.